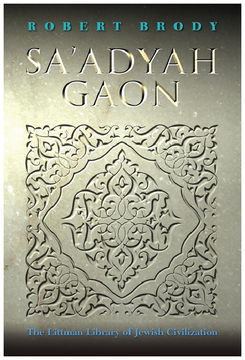 Sa’adyah Gaon was an outstanding tenth-century Jewish thinker—a prominent rabbi, philosopher, and exegete. He was a pioneer in the fields in which he toiled, and was an inspiration and basis for later Jewish writing in all these areas. The last major English-language study of his work was published in 1921, long before Genizah research changed the understanding of the time in which he lived. Robert Brody’s masterly work, covering Sa’adyah’s biography and his main areas of creativity in an accessible way, is therefore a much-needed reassessment of an outstanding figure. The opening chapter, on the geonic period that formed the background to Sa’adyah’s life (a period on which there are few works in English), is followed by an overview that brings out the revolutionary aspects of his work and the characteristic features of his writings. Subsequent chapters consider his philosophical works; his Bible commentaries; his pioneering linguistic work; his poetry; his halakhic activity (including an examination of his use of the Palestinian Talmud compared to that of the Babylonian Talmud); and his activity as a polemicist, notably against the Karaites. An Epilogue sums up his importance in medieval Jewish culture. Particularly valuable features of the book are the copious quotations from Sa’adyah’s works, which facilitate familiarity with his style as well as his ideas; the clarity in presenting complex and difficult concepts; the constant assessment of his relationship to his predecessors in his various fields of study and his own unique contributions to each field; and the contextualization of his contribution within the political, cultural, and religious climate of his times so that both revolutionary and conservative elements in his thought can be identified and evaluated. Robert Brody is Professor of Talmud at the Hebrew University of Jerusalem, and has taught at Yale and Harvard universities. He is also the author of 'The Responsa of Natronai bar Hilai Gaon' (1994, second edition 2011), which was awarded the Jerusalem Prize for Rabbinic Literature, and 'The Geonim of Babylonia and the Shaping of Medieval Jewish Culture' (1998), which received a National Jewish Book Award.